Genuine Smithfield Hams have crowned America’s tables for generations. They are as distinctive as they are delicious, as elegant as they are hearty. They are the flavor of Southern Hospitality. The Luter family of Smithfield, Virginia, has been curing and selling hams since the turn of the century. Joseph W. Luter, Sr.’s first job was at a local meat packing plant. His young son, Joseph W. Luter, Jr., followed in his father’s footsteps, learning every phase of the meat packing industry. And eventually persuading him start their own business - Smithfield Packing Company was chartered in 1936. In 1962, with Smithfield already on its way to becoming the “Ham Capital of the World”, Joseph W. Luter III took the reigns. Expanding the plant’s facilities and product line became the key to a growth cycle that promoted Smithfield Packing Company from a family business into a large, investor-owned and publicly traded company. Today with Joseph W. Luter IV on board, the company retains its family heritage and has become a worldwide marketer of pork products and one of America’s largest meat companies – poised for significant growth and expansion. Over the years, the curing process for Genuine Smithfield Hams has changed little. However, with the development of high-tech hog breeding techniques, there is now a new generation of pork that combines yesterday’s goodness with today’s leaner taste. And Smithfield is making it easier and more convenient to serve. Thank you Table For 7 for the versatile award. Thank you so much! I truly appreciate it. Preheat oven as directed on the ham package and follow directions for baking the ham. In saucepan, over medium heat. Combine golden eagle syrup, ground ginger and light brown sugar. Bring to boil for 5 minutes. Pour or brush glazed on ham the last 15 minutes of baking. Enjoy! 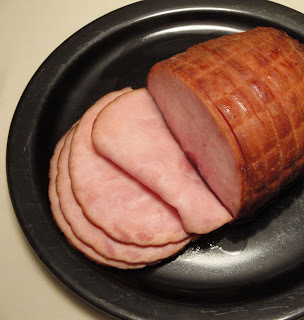 Note: The ham is already cooked when you buy it, you just need to heat it through for eating. Line you baking dish with tin foil for easy clean up. Perfect timing for Easter looks awesome! I love this kind of ham during the holidays. Looks fantastic! Mmmm I love a brown sugar glaze on ham! This looks gorgeous and now I can hardly wait for these next 2 weeks to pass until Easter! We always have a big delicious golden ham. Hopefully its as good as I'm sure yours is! This is such a perfect way to enhance the flavor of a regular ready-to-eat ham! That looks great, I could only imagine how good the golden syrup would taste with ham. Yum! That sounds perfect! Love the glaze recipe :) Thanks for sharing! I love glazed ham. It might just be the greatest thing on earth.